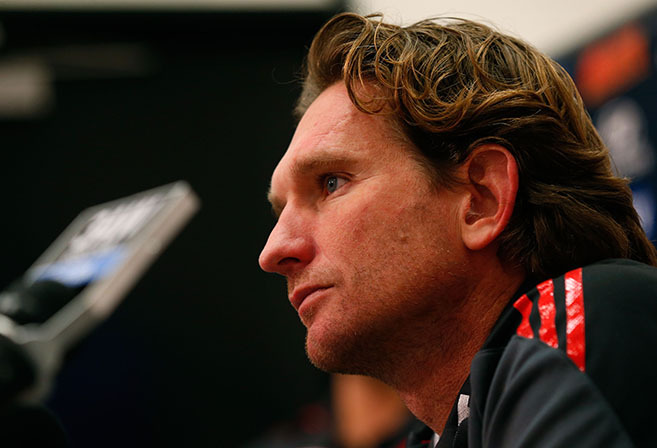 Yesterday saw the end of the legal profession’s favourite AFL coach, James Hird. At a press conference, Hird announced that he had reached an agreement with the Essendon Football Club board that the best course of action for the club was to pay him out a large sum of cash to go away, just like last year. Thus brings to the end the illustrious coaching career of Windy Hill’s favourite son — and what a career it was. As coach, James Hird bought so much to the game, such as Stephen Dank, peptides, Tanya Hird and, in 2013, a government minister holding a press conference to declare “the darkest day for Australian sport”. Of course, with the benefit of hindsight the minister should’ve held off that declaration until after Australia’s debacle at the Third Test at Trent Bridge. Hird’s departure poses many questions: not least of which is what will The Ages‘ Caroline Wilson find to write scandalised pieces about now? And where to for James Hird himself? Possibly now he’ll find time to fulfill his long-held dream, as The (un)Australian has reported, of riding in the Tour De France. With the AFL’s multi-billion dollar TV deal, networks will be lining up to buy his story. There is also talk Hird could be tapped to take over as host of the popular TV Show Deal Or No Deal? Whatever the future holds for James Hird, we at The (un)Australian say so long, farewell and Danks for the memories.